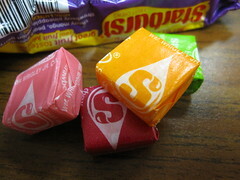 The thought makes me cringe now, but I used to play with my Starbursts like modeling clay to create hybrid flavors. I would mold two or more flavors together, make little shapes, and eat them. The idea of handling candy so thoroughly grosses me out these days, but maybe it was part of the reason I rarely get sick as an adult. The newest (to my knowledge) offering from Starbust is called Sweet Fiesta, and it offers a more sanitary set of hybrid flavors. 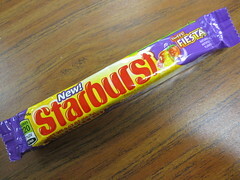 The fiesta includes Strawberry Pineapple, Peach Guava, Cherry Mango, and Melon Berry. Though the flavors are different, I was certainly reminded of the recent Skittles Blenders. I could smell the pineapple in Strawberry Pineapple, which got me excited. It had a sour, juicy, slightly woodsy flavor, and I could taste the pineapple much better than the strawberry (fine by me). It was a great combination of sour and sweet. Peach Guava had a tropical, papaya juice-esque flavor. I could only catch a slight hint of peach, and this one was quite sweet and juicy. Cherry Mango had a fantastic cherry flavor that seemed better than the regular cherry Starburst, but I couldn't figure out why. I didn't taste the mango, just a modified cherry. It reminded me of fruit punch. 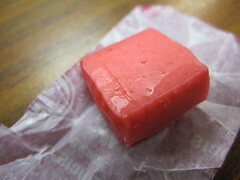 Melon Berry had a very fake melon flavor with a richer berry background flavor. It was my least favorite flavor of the bunch, but it wasn't bad. Overall, the combinations felt fresh, and although some of them missed the mark, it was hard for me to save any for my husband (though I managed to leave him one of each flavor and a spare Melon Berry). Check out some other reviews at Sugar Hi and Sugar Pressure.